If you truly love the game of golf, it may be your dream to make a living from it by teaching others how to play. Below we take a look at how to become a golf teaching pro. If you fall in love with the game of golf, sooner or later the fantasy of making a career of your passion is going to surface. Becoming a golf professional (the teaching kind, not the Tiger Woods kind) isn’t easy but that doesn’t mean that you can’t do it. There are plenty of people who are paying their bills by their love of golf and with the proper practice and knowledge, you can certainly be one of them. 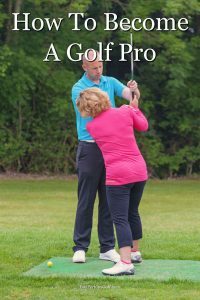 If you want to make money doing the thing that you love the most, read on for a comprehensive guide on how to become a golf professional. The truth of the matter is that not everyone can be a golf professional. If you play a few times a month and struggle to break bogey, chances are the life of a golf pro probably is not for you. Disappointing, I know, but don’t fret too much. There are plenty of careers in golf that don’t hinge on your ability to teach or play the game. Now, if you do want to make your money teaching golf but you aren’t quite good enough as of right now to go pro (so to speak) you can always work on improving. In the meantime, here are a few things that you will need to consider to determine whether or not the life of a golf professional is even suitable for your lifestyle. There is no delicate way of saying this, but golf professionals don’t necessarily make the highest incomes. Don’t get me wrong, it’s still a very livable wage but you shouldn’t go into the job expecting doctor money. That said, there are certainly golf professionals out there that are making the big bucks. After all, even tour pros need teachers. And even if you can’t land a job teaching the game’s best, you can certainly set higher rates once you earn a reputation as a good instructor. Just be aware of the fact that starting salary for most teaching professionals may leave something to be desired depending on the lifestyle that you are used to. How passionate are you really about the game? Is it something that you enjoy on the weekends, or is it a game that you love so much that your passion will come across to all those that you teach? The process of becoming a pro (which we will get into shortly) is long and difficult so be sure that your love for the game of golf is something that will last for many years to come. Keep in mind that making a career of golf requires getting up early and working weekends and many holidays so determine whether or not those are trade-offs you can live with before you begin the process. Good communication skills really are a must with this career path. If you’ve ever taken golf lessons before, you are probably well aware of how important it is to have an instructor that is able to articulate their instructions well. A teacher of golf is still a teacher so make sure that you are up for the challenge of imparting knowledge to even the most difficult to work with students. One of the most common complaints issued against teaching professionals is their inability to put complicated concepts into terms that the struggling beginner will be able to understand. While your ability to get hired may not be contingent on your capacity to do this, your success as a teacher may very well be tied to your ability to make complex aspects of the swing understood by your students so try and make an honest assessment of your ability to accomplish this. The life of a golf professional is not, by definition, transient, but there are also a limited number of teaching jobs available. Not all golf courses employ teaching professionals at all, and the ones that do usually only keep one on the payroll at a time. If all of the golf courses in your area are already fully staffed you may need to look elsewhere for employment. While some golf retail stores will keep a pro on staff this is somewhat rarer, and generally also less lucrative than working for a course. There is certainly no guarantee that you will have to move should you choose this lifestyle, but you should make sure that you are willing to do it should it become necessary. To get the best jobs, it is not uncommon for qualified professionals to have to move great distances to get a job. The things listed above certainly were not cons – but they were aspects of the job that many people might find challenging or difficult. Since we’ve looked deeply into that component of the career, it is only fair that we now examine some of the sweet benefits of taking up a job as a golf professional. Free equipment is not necessarily a guarantee, especially not before you have established yourself, but once you do get settled in as a professional, you can expect to get some free goodies. Club manufacturers will often establish partnerships with professionals allowing them to use their latest and greatest equipment for free. They’ll even hook you up with a “staff bag,” that you see the pros on TV toting. In exchange, you are expected to serve as a sales representative. Since players will often consult professionals on what sort of equipment they should purchase, you will be expected to encourage players to sample the wares of your equipment partner. It’s a great bargain for those that don’t want to spend thousands of dollars regularly updating their bags, but the only con (if you could call it that) is that you won’t be able to sample clubs from other manufacturers while under contract. You’ll occasionally hear people mention that teaching professionals are so busy teaching people the game that they never have the time to actually play it themselves. This is not explicitly true. It would be much more true to say that you won’t be able to play during prime time anymore. Those, after all, are your main business hours. However, when you do get the chance to sneak away, you can count on getting your golf for free, especially if you plan to play at the course that you work for. Unlimited free golf is certainly a big pro. Every teaching pro that I know (and I do know many) has their share of stories about the interesting way in which their careers have allowed them to interact with golf history. I know pros who have played with major winners, looped for Jack Nicklaus, and even had the opportunity to design their own courses. Of course, I cannot guarantee any of those experiences, but I can tell you without a doubt that you will be an integral part of the sport you love if you choose this career path. I’m sure you have heard the old phrase “if you love what you are doing you never work a day in your life.” It definitely pertains here. Now that we have examined the triumphs and tribulations of the job, let’s dive right into how you can make it yours, shall we? In order to register you will need to be eighteen years old and have completed high school. If you are a citizen, proof of citizenship will be required to register. If you are not a citizen you will need to be a registered alien. The Pro Golf Association will also require that you have six months of relevant employment experience at the time of registration. You can find an extensive list of what jobs they consider relevant on their website. If you meet these requirements you will be able to begin the first steps of the program. Naturally, the PGA wants their teaching professionals to be skilled. In order to start working on the PGA’s testing material you will first need to demonstrate your chops as a player. This is accomplished via the “Player Ability Test,” or the PAT. The PAT takes place over two rounds, with the player being expected to shoot a low score both days. While their expectations will depend on the slope rating of the course, you can generally plan on shooting 2 – 3 over par per round. Any higher than that and you will not meet their requirements. Averaging two-three over par per round certainly is not an easy feat. The vast majority of players never even glimpse scores like that, but the vast majority of players also do not consider making a career out of golf. Unless you are already shooting scores like this, there really isn’t much of a point in considering trying to become a teaching professional. There is no shame in taking a year or two to work on getting your scores down. It will give you an excuse to play more golf, and I have even known pros to allow those chasing a career in golf to practice for free. Regardless of how long it takes you to overcome this hurdle, once you are able to shoot two qualifying scores, you can move on to the next step. This is where the process begins to get a little bit expensive. In order to become an apprentice, you need to first register with the PGA, which will set you back somewhere in the neighborhood of five hundred dollars. In addition to that, you will also need to purchase your “level 1 kit,” which is essentially a set of educational materials that you will need to complete in order to advance to the next stage. The level 1 kit will cost you another $500 dollars. As far as upfront costs are concerned this is fairly high, but do keep in mind that career education nearly always comes with a price tag, and often enough it is one that is a great deal more significant than this. Technically you have two years to complete the coursework for each level, though you should be able to get it done much quicker than that. Level 1 includes testing material on the rules of golf, tournament operations, and club design and repair. The good news is that with the exception of tournament operations, the passionate golfer may already have a firm understanding of the materials covered in this module. Either way, once you complete the work, you turn it in for review, and are then required to take a test on the material. When you pass the test, you can proceed to the next modules. There are three total testing modules during your apprenticeship that get more difficult as you go along. Module 2 consists of swing analysis, business planning, and customer relations. The third and final phase studies swing concepts, management, and supervising. Once you have completed all three of your modules, you will be able to take your third and final step to becoming a pro. Amidst all of this you will also be expected to get thirty-six hours of experience. These experience hours can be collected through a wide variety of ways, including college courses. Otherwise, you can earn one credit a month working alongside a certified PGA professional. Fortunately, this part of the process can be achieved while you are completing your other modules so that once you complete your third phase you will be able to get your certification. Once you complete all three modules, and attain your certification credits, you are in and you can begin your career as a golf professional! If you require a more traditional class setting to keep you motivated, there are accredited two-year colleges designed specifically with the intention of starting people out in a career in golf. These schools offer a structured environment in which can get the education that you need to become a golf professional. While this path is going to be more expensive than the last option that we looked at, you will be given more resources, more guidance, and more connections. You’ll recall earlier that I mentioned finding a job might not be extremely easy. That is true, but you may find that it becomes easier if you are able to make the extensive connections that can develop in a school setting. Ultimately you will have to decide for yourself which method best suits your needs but do also note that there is a degree of pedigree that accompanies attaining your certification through a classroom setting. Given how competitive finding a job on a golf course can be, anything that sets you apart from other candidates is sure to be beneficial. We’ve looked at how to become a golf pro. As you can see, it’s not going to be easy but that is not to say that it isn’t worthwhile. A lot of people hate their careers and dread going to work. If you decide to take the above-illustrated steps towards becoming a teaching professional, workplace dissatisfaction is one thing that you will never have to worry about. If you are reading this, you very obviously love golf. Very rarely are we given the opportunity to make a living doing something that we love. This is yours. If you want a career teaching people the game you love more than anything, then you know what to do. Improve your life by getting certified as a PGA teaching professional.